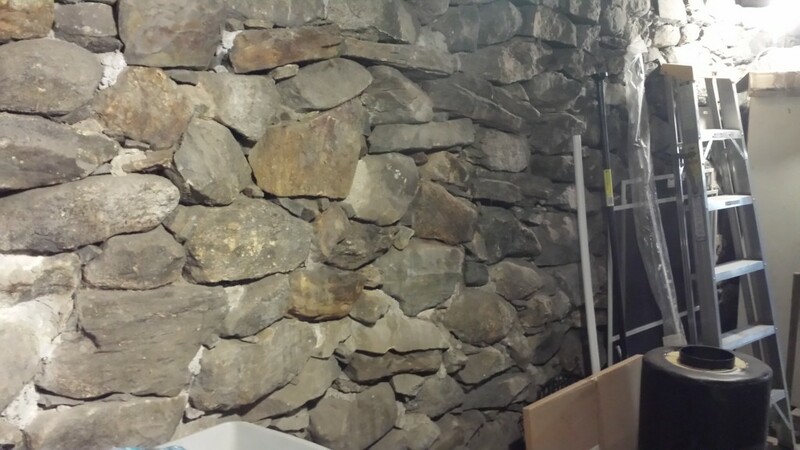 Do you have an old stone foundation that you need repaired? We can help, but first some information. A couple hundred years ago we didn’t have poured concrete foundations, flue liners or Diet Pepsi 🙂 A lot of people in Massachusetts and all over the country have basements built with rocks and mortar. Many of them leak water, have chipmunks darting in and out of the crevices as well as dust and spiders. A little bit of history here before we dive into the best way to go about dolling up these walls the best we can. Before 1930 or so most all masonry was built using a mortar made with lime and sand. Read more about lime mortar. Its important to know this before proceeding with any repairs. Portland cement was patented in Great Britain in 1824. It was named after the stone from Portland in Dorset which it resembled when hard. This is a fast-curing, hydraulic cement which hardens under water. Portland cement was first manufactured in the United States in 1872, although it was imported before this date. But it was not in common use throughout the country until the early 20th century. Up until the turn of the century portland cement was considered primarily an additive, or “minor ingredient” to help accelerate mortar set time. By the 1930s, however, most masons used a mix of equal parts portland cement and lime putty. Thus, the mortar found in masonry structures built between 1873 and 1930 can range from pure lime and sand mixes to a wide variety of lime, portland cement, and sand combinations. In the 1930s more new mortar products intended to hasten and simplify masons’ work were introduced in the U.S. These included masonry cement, a premixed, bagged mortar which is a combination of portland cement and ground limestone, and hydrated lime, machine-slaked lime that eliminated the necessity of slaking quicklime into putty at the site. Read my favorite article on preserving antique masonry. The difference between the mortar we use today and the old time lime mortar is the ingredient Portland, in simple to understand terms. This is the main ingredient in concrete. It is much more rigid and less permeable to water. This sounds like a good thing, no? Well yes and no. Yes for building new masonry components, and good for repairing structures made with a portland based mortar. It is unfortunately VERY BAD for antique masonry built with a lime based mortar. How so, it sounds like it would be stronger and less affected by moisture. When repairing masonry the mortar that is replaced needs to be the same or LESS strong then the original mortar. A typical type N mortar that I build chimneys with or a brick veneer has a PSI of 750 @ 28 days. A type S which is typical for below grade work is much more then that. 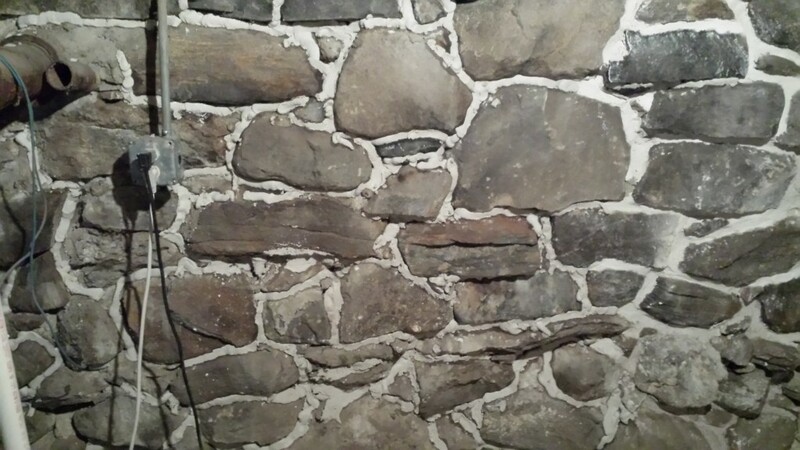 When repairing antique mortar I use Limeworks repointing or repair lime. These mortars will have a compressive strength of 500 psi and are very suitable for repairing antique brick as these bricks are very soft. The properties of such a mortar allows it to give and flex with those old brick and stone foundations and walls. It self heals believe it or not. A stronger portland mortar would actually do severe harm to an antique masonry wall. What happens with the resistance of water absorption is it also is less able to evaporate the moisture out of the structure as well. Whats the apparent weakness of the lime mortar is actually one of its strengths. The lime mortar is extremely good at wicking moisture out of the wall and letting it evaporate. If this function is shut off, by either a portland based mortar or a water proofer, a paint, foundation tar….anything that stops the evaporation of the water, the lime mortar will suffer accelerated deterioration. Have any of you ever seen the crumbly mortar maybe even seen it turned back into almost sand? That is from being saturated without evaporation and being destroyed over time. Remember this chimney, it failed because water was being trapped inside it, somehow. This is exactly what will happen if you allow someone to repoint your foundation walls with a typical portland based mortar. Sure it may take a few years, maybe even 10, but eventually you will be left with crumbly powdery sand lime mortar and brick faces that are chipping and popping off. Foundations built a hundred years ago had no footings, no vapor barriers, so the masonry was designed to handle the dampness of the soil. Todays cements are not equipped to do that. The usual scenario is something like this. The foundation is a lot of times built with brick on the top couple feet or so. The outside mortar washes out and it is repointed easily enough by a mason. It wont be long before you notice the inside of the walls, the mortar, getting crumbly and making a mess on the floor. If the inside is repointed with the same kind of mortar this is where the problem will become much worse. At some point the mortar on the outside will push out, due to moisture in the brick, the joints will fail. Then the inside will do the same while the mortar in between is turning to powder. Perhaps another mason repoints the bricks again, making sure no evaporation is happening. I suppose eventually enough of today’s mortar will be in the wall that it will take over for the lime mortar. If you would like a consult on your antique masonry feel free to Contact US or call 978-356-6800 and we can discuss your needs.